Do you want the Alwa’s Awakening Soundtrack as a NES-rom? Head over to Elden Pixels site. Now it’s released. 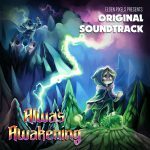 The Original Soundtrack from Alwa’s Awakening! It contains 24 songs composed by me. It also feature a guest track by Prof. Sakamoto. The music is composed in Famitracker, an excellent program that lets you make your own NES-music. We have been working hard with this game for almost two years now. Finally it’s time to vote for Alwa’s Awakening on Steam Greenlight! Please help us, we really want to release the game on Steam. Vote YES for Alwa’s Awakening on Steam Greenlight here! I am currently making music and sound effects for a cool indiegame called Alwa’s Awakening. It is an adventure game made for modern platforms but with the feel and look of a Nintendo 8-bit game. We’re inspired by old NES games such as Battle of Olympus and Solstice but also new games like Battle Kid and the Trine series. Victor Clausson from Revansch! made this awesome trailer together with the Retrospelsmässan Crew. I made the music, it’s called “Retrospelsmässan 2015”. You can find the song on Spotify. I have always wanted to release my music so that it would be availible for easy listening for everyone. Thanks to RouteNote, my music is up on Spotify.